Professor Thad A. Polk is an Arthur F. Thurnau Professor in the Department of Psychology and the Department of Electrical Engineering and Computer Science at the University of Michigan. He received a B.A. in Mathematics from the University of Virginia and an interdisciplinary Ph.D. in Computer Science and Psychology from Carnegie Mellon University. He also received postdoctoral training in cognitive neuroscience at the University of Pennsylvania. 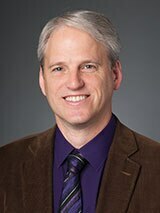 \r\nProfessor Polk’s research combines functional imaging of the human brain with computational modeling and behavioral methods to investigate the neural architecture underlying cognition. Some of his major projects have investigated differences in the brains of smokers who quit compared with those who do not, changes in the brain as we age, and contributions of nature versus nurture to neural organization. Professor Polk regularly collaborates with scientists at the University of Texas at Dallas and at the Max Planck Institute for Human Development in Berlin, where he is a frequent visiting scientist.\r\nProfessor Polk regularly teaches on topics ranging from the human mind and brain, to cognitive psychology, to computational modeling of cognition. His teaching at the University of Michigan has been recognized by numerous awards, and he was named to The Princeton Review’s list of the Best 300 Professors in the United States.